Lorraine Mable Cavanaugh, 91, passed away on Saturday, August 13, 2016. 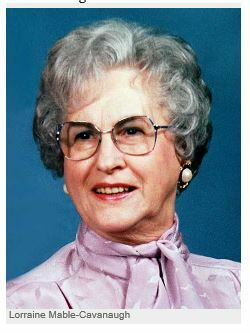 She was born on January 5, 1925, to Eldon and Hilda (Eyman) Jackson in Yoder, Oregon. Lorraine lived on the same farm where she was born. She was a member of the Woodburn Foursquare Church for 64 years where she also played the piano; and also the place where she met her husband, Robert Cavanaugh. Lorraine married Robert in Portland on July 28, 1964. She worked as an office manager for many businesses as well as an interior decorator. Lorraine enjoyed spending time with her family, planting flowers and landscaping. She was a member of the Indoor Light Garden of Portland Rose Society. Lorraine Mable Cavanaugh She is survived by her husband, Robert; sons: Neal White, Merle White and Marshall White; step-children: David Cavanaugh, Diane Metz and Dean Cavanaugh; 11 grandchildren and many great-grandchildren. Private graveside service will take place at Bell Passi Cemetery in Woodburn, Oregon. A memorial service will take place at a later date. Arrangements by Unger Funeral Chapel, Mt. Angel.